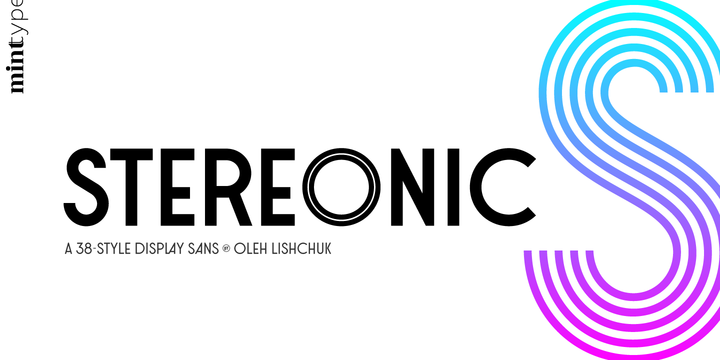 Stereonic is a geometric sans serif typeface created by Oleh Lishchuk and published by Mint Type which is available in 38 styles, 5 widths (XS, S, M, L, XL) each with useful weights that you can mix them and have many possibilities. Inspired by Art Deco style, is suitable for editorial use, logo, poster, magazine but also for music applications. Have fun! Styles: XS, XS Stencil, XS Underline, XS Overline, XS Doubleline, S, S Contour, S Inline, S Stencil, S Undrline, S Overline, S Doubleline, M, M Multiline, M Contour, M Inline, M Inline 2, M Stencil, M Undrline, M Overline, M Doubleline, L, L Multiline, L Contour, L Inline, L Inline 2, L Stencil, L Overline, L Underline, XL, XL Multiline, XL Contour, XL Inline, XL Inline 2, XL Stencil, Extras Light, Extras Bold. Price: starting from $30 for one font to $195 for all 38 fonts. A font description published on Wednesday, January 24th, 2018 in Fonts, Mint Type, Oleh Lishchuk by Alexandra that has 1,731 views.